What's Gotten Into These Stocks? What's gotten into Hansen Medical and Pacific Biosciences? What's gotten into these stocks? Two stocks in the health-care sector have been on solid run-ups in recent weeks. Hansen Medical (NASDAQ:HNSN) shares jumped more than 16% in the last month, while shares of Pacific Biosciences of California (NASDAQ:PACB) are up nearly 33% over the same period. What is behind these increases? Let's take a look. Hansen Medical makes surgical robotic systems, namely Sensei and Magellan. Sensei helps physicians collect electrophysiological data within the heart atria. Magellan is used by physicians in clearing clogged arteries in patients' arms and legs. Unfortunately for Hansen, sales for the Sensei system, which has been commercially available for more than five years, have yet to really take off. Magellan has been available for a little over a year, so it's still too early to tell how sales will fare for the newer system. 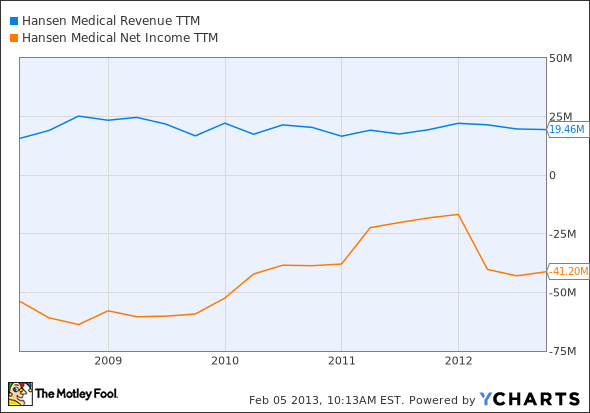 HNSN Revenue TTM data by YCharts. The chart shown above illustrates Hansen's problems. Sales have been relatively flat for the last five years. Meanwhile, the company has continued to operate in the red the entire time with no sign of profitability on the horizon. And yet Hansen's stock has been on a tear recently. What's the catalyst? There have been no big news stories or other obvious developments to explain the stock's rise. The only truly notable activity in the past month is additional insider purchasing by Larry Feinberg, head of Oracle Investment Management. Oracle Investment Management currently owns nearly 11% of Hansen. However, Feinberg's buying so far in 2013 hasn't been huge (less than $250,000) and is a continuation of relatively steady purchases since October. Unusually heavy volume occurred on Jan. 22, a day that saw Hansen shares jump around 14%. Obviously, more people than just Larry Feinberg are buying. The question is, "Why?" Unfortunately, in absence of concrete facts, we're left only with speculation. One possibility is that some think that a potential acquisition of Hansen is in the works. A possible buyer could be Intuitive Surgical (NASDAQ:ISRG). Intuitive already has paid $20 million to Hansen for licensing of technology and $10 million for nearly 5.3 million shares in stock. Another possible buyer is St. Jude Medical (NYSE:STJ). Hansen and St. Jude have a co-marketing agreement in place for integrating the Sensei system with St. Jude's Ensite cardiac mapping system. Both Intuitive and St. Jude have plenty of cash to pick up Hansen. Both have reasons to be interested. If any acquisition talks are under way, though, Intuitive Surgical looks to be the more likely buyer, since it already has skin in the game. At this point, however, we're still only talking about "ifs" and "maybes." Pacific Biosciences has had an even bigger run thus far in 2013. Shares were up close to 80% for the year before pulling back. What jump-started the climb for this small-cap DNA sequencing company? Two key factors appear to be at work. First, the company announced good news in early January. The 100K Pathogen Genome Project selected PacBio's SMRT technology to sequence the genomes for at least 1,000 foodborne pathogens. This announcement could represent the beginning of a turnaround for PacBio, which didn't record any instrument sales last quarter. Analysts are expecting the company's fourth-quarter results, which are released today, to improve somewhat. Second, investors likely see PacBio as a possible acquisition target. This is especially true after Roche threw in the towel on buying Illumina (NASDAQ:ILMN) in the first few days of 2013. Roche chairman Franz Humer commented that his company had other options besides Illumina. Some think that Roche might still buy Illumina, but Humer said that a deal "is definitively off the table." If so, PacBio could be among those on the table. Another reason for interest in the stock could stem from insider activity. PacBio CEO Michael Hunkapiller bought more than $1.4 million worth of shares in November and December. Hunkapiller, along with CFO Susan Barnes, also agreed to receive only $1 in salary for 2013. Many investors take notice when a CEO puts his own money at stake. Whatever has gotten into these stocks has handsomely rewarded investors thus far in 2013. Is it time for those who haven't bought shares to get in on these quick movers? The answer to that question is "maybe." These are speculative plays that many investors will want to avoid. However, some might be willing to take the risk for the possible returns that could come, especially if either company is acquired. Just remember that what (or who) has gotten into these stocks could just as quickly get out.